Follow Catesby, a colored blacksmith, in his never ending quest for freedom. Learn from his viewpoint what is happening in the long drawn out war. His journey is unforgettable. 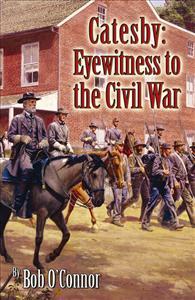 Catesby: Eyewitness to the Civil War is the saga of a real slave who was captured by John Brown during the famous raid at Harpers Ferry in 1859. The book follows Catesby’s life after the raid and his determined quest to become a free black man. During his journey, Catesby encounters abuse, terrible conflicts, trusted friendships and love, as the war seems to follow him from place to place. A skilled blacksmith and an educated man, Catesby becomes the “inside source” to describe events you could not even imagine. You will find his story unforgettable, but also very believable. Catesby: just the very name enlivens your curiosity! After the first few pages, you will be hooked on this captive story and this believable character. The more you read, the more you will be pulled into the story of the Civil War time period and Catesby's quest to live a full, free life. Each part of his story will have you cheering for him, for his quest for freedom, and for his desire to have a productive, contributing life as a free blacksmith. Each character who interacts with Catesby enriches the story. I was very sad when the story ended. This is Bob O'Connor's third, and in my opinion, the best so far. To those who study the history of African-Americans in the antebellum period, Catesby's story epitomizes the absoluete barbarity and debasement that the "peculiar institution" of slavery perpetuated on a race and its culture. Further, Bob O'Connor's well-researched description of the horrors of imprisonment at Andersonville Prison Camp in Georgia, 1864, will grip the heart and soul of those readers who are descended from soldiers who suffered and died there. One becomes a part of Catesby's struggle to obtain freedom; we feel the protagonist's joy, pain, and sorrow. The ending was a complete surprise! An absolute read for history lovers.